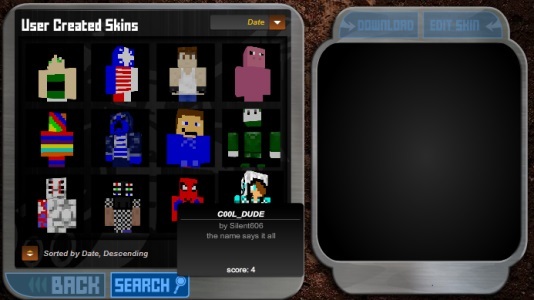 Different from other normal games where characters are designed or fixed by creators, Skincraft is the game where players are free to make use of their imagination. Among four sections including New Skin, Import Skin, Load Data, and View Uploads, lots of players in the world are fond of two first ones. New Skin allows them to design their own favorite appearance with various help from the program. In adding a new layer in New Skin, players not only get support with Pre-made but also work mainly themselves with Custom. Once you visit Pre-made section, things go in details from body parts to colors. Even the background is fairly varied, so designers must be satisfied with a wide range of choices. If some of players are the ones who are patient and clever, Custom is very suitable for their taste. By finishing piece by piece, designers may create the same Minecraft image as what they have dreamed about. Though Custom may take lots of time, the product must be unique that cannot be found in anywhere. It is said that the more someone puts their effort into their work, the greater their feelings are. For each section, other options are available to help players. For instance, in Custom, besides Pencil, Eraser, Bucket, or Undo, whenever players drag the drawing tool, it will show the location of body parts such as Head Front, Head Top, Head Bottom, Head Back, Head Right, Unused, etc. in detailed way. Hence, players are easier to draw and design their wonderful work. In short, Skincraft welcomes all creativity, and imaginary mind from players. Why don’t you take some time to create a Minecraft character of your own? Skincraft is controlled with the mouse.